It's time to stock up on K-Cups! 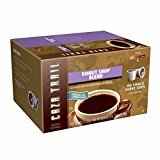 Amazon has a 20% off Caza Trail coffee coupon. Plus, choose subscribe & save to get an additional 5% off! Check out these deals, to get K Cups for just 26¢ per cup!